How are you all this fine Friday? I'm ok. I've had a pretty good week. After a rather awful and stressful start, I ended up with a good mark on an assignment, I won an honourable mention in a nation-wide writing competition with a story that barely passed last year (my creative writing teacher at uni did not like it, to say the least), which also resulted in me winning a lovely few hundred bucks, and I broke my PB for 5km. Unfortunantly today I was having some awful back spasms, and my left calf was killing me, so I didn't make it to the gym. In all honesty, this rather annoyed me as I already took a rest day earlier this week and really wanted to go. But I suppose it's better to take one day off then a week, and I don't want to hurt myself. Other than that, nothing incredibly exciting to report. But I have been eating well lately, and these protein balls are one of my creations. Now I know you've probably seen versions of these everywhere, all over the internet, so this is not a new or thrilling invention. The recipe is based off several all over the internet. But I love how these ones in particular taste. They definitely kill the sweet tooth. These taste like honey; you could almost swear you are eating honey. They are also perfectly chewy and the almond butter adds a delightful kick. 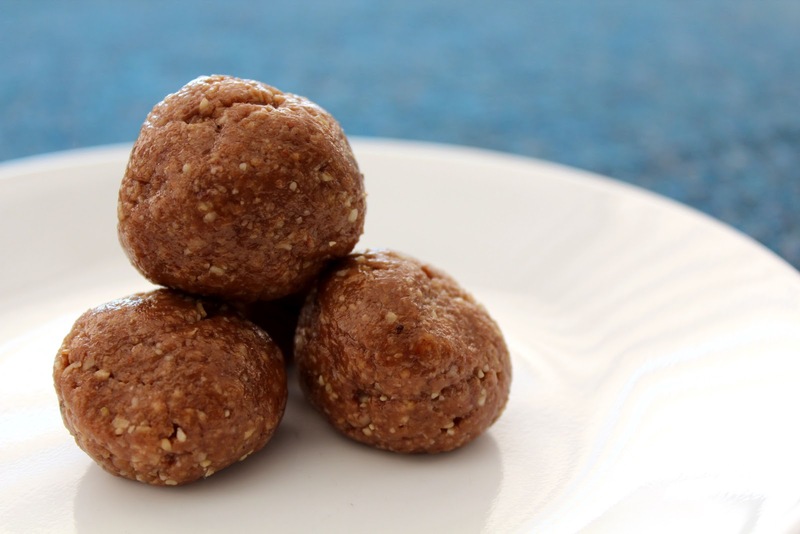 So really, if you've been looking for a great protein ball recipe, look no further. If you are looking for a snack that is bite-sized, portable and filling, then look no further. Menu Options: This recipe is so basic, you could simply add whatever you like. Instead of using raw cacao powder, you could use chocolate protein powder, vanilla protein powder, regular cocoa powder, dark chocolate bits... whatever you chose. You could always get rid of the chocolate all together and add coconut. You could grind up small nuts and use them as well – adding almonds to this would make this a true superfood recipe. You could use maple syrup instead of honey. Any other nut butter instead of almond butter – though, the almond butter is slightly more bitter than other nut butters and I’d probably only replace it with peanut butter. You could also add flax seeds, LSA, dried fruit – really, whatever you chose. But this recipe is a good, simple base. Makes 10 – 12 balls. Nutritional content based on 12 balls. 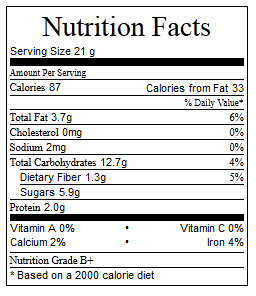 Take this value with a grain of salt, as it truly does depend on the honey, almond butter and chocolate powder you use. In a food processor, grind the oats until they form a thin, almost-powder like substance. Add the remaining ingredients and grind until a doughy, wet mixture is formed. If necessary, add more honey or water so the dough comes together. If it is a little too wet, or a little too dry, that is ok, because the balls will set in the fridge. Using a tablespoon or teaspoon, scoop up the mixture and using your hands, roll the dough into balls. Repeat this until 10 – 12 bite-sized balls are made. 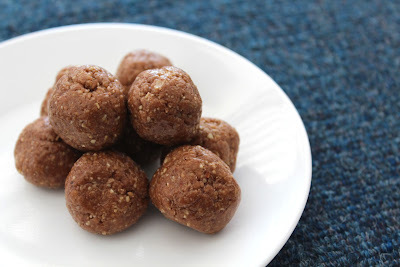 My protein balls were big enough for two bites per ball. Place the protein balls in the fridge until they are set and relatively hard. Serve cold from the fridge. You really do like your honey, I have actually never made any sort of ball cookie. I do love my honey :) I make them all the time - they're pretty good! These are a perfect snack to have on hand! Quick, easy, and healthy! These look super good! I love the minimal amount of ingredients. 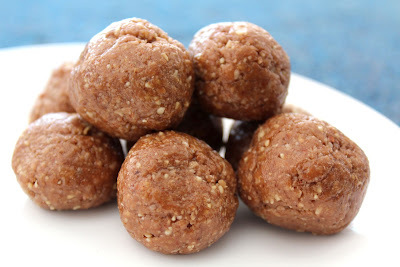 Protien balls make such a great snack. So easy to make too, yum! Thanks - they're the best little treat ever.